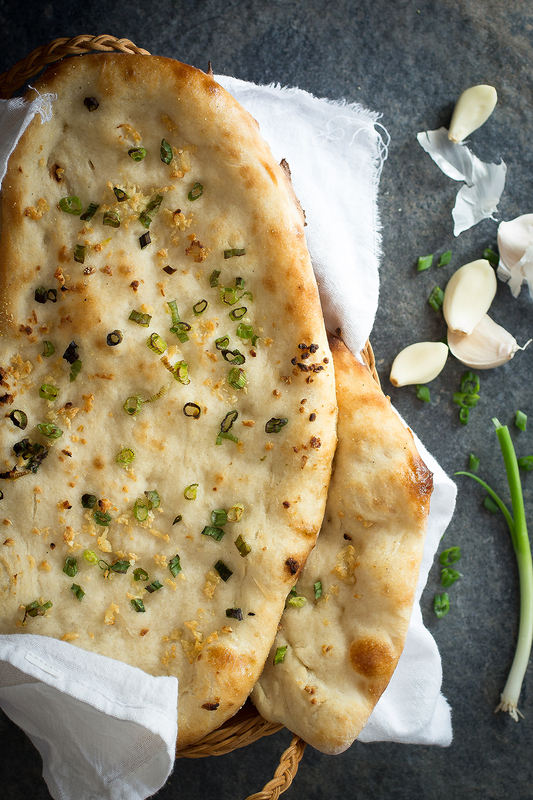 A chewy homemade naan bread covered in fresh minced garlic and green onions. This is the perfect accompaniment to any spicy meal. Add the water to a medium sized bowl and sprinkle the yeast on top of it. Stir the yeast until it's dissolved. Add 3 cups of the flour and salt, and stir with a heavy spatula or wooden spoon until smooth. Add the remaining flour. Stir again until well combined and dough comes together in a ball. Turn dough out onto a clean work surface dusted with some flour. Start to knead the dough, dusting with more flour if things get sticky. Once the dough is soft and elastic, about 2-3 minutes of kneading, place the dough back into a bowl that is coated with a little olive oil. Turn dough to cover all sides with oil. Cover with plastic wrap or towel and let rise in a warm place for 1½ hours or until almost doubled in size. Once the dough is ready, preheat your oven to 550°F or as hot as it can go if not that high. Place a pizza stone or a large upturned, baking tray, dusted with a little corn meal, on the top shelf of the oven as it heats up. Turn dough out onto a floured surface. Cut into 4 pieces. Using your fingertips press each piece of dough into an oval shape about 8 inches long and 6 inches wide. Brush dough with some olive oil and rub some minced garlic over the surface. Sprinkle with the green onion and carefully transfer to the pizza stone or baking tray. Use a pizza peel or parchment paper to transfer dough to oven. Bake in the oven for about 10-15 minutes, longer if you like it crustier. Once the naan has finished baking, transfer it to plate and cover with a clean towel. Proceed the same way with the other dough pieces until all of them have been baked. The bread is best served warm and can be reheated covered with foil in a 350 °F oven for 5-7 minutes. Option: For a more 'flavored' dough, add the minced garlic and green onion directly to the dough during mix instead of on top of dough before baking. The garlic naan looks yummy. I dont have a pizza stone, so, how can I bake? Can I cook on stove top? Please let me know. Thank you. You can use an upturned baking tray, dusted with corn meal, in place of the pizza stone. You can cook on the stove top on a nonstick pan…roll the dough to the shape you wish..round or square…add one tsp of oil to the griddle or pan..add your nan using a spatula turn on to the other side as well golden brown.